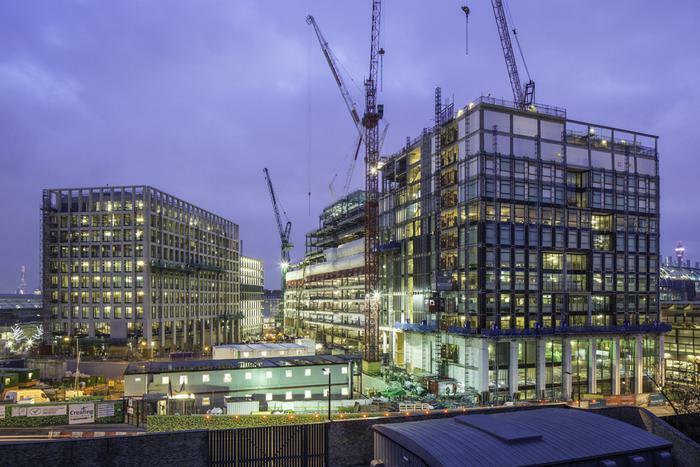 LONDON’S innovative multi-use community building Five Pancras Square has leading HVAC business TROX UK to thank for some of the technical brilliance enjoyed on site. Rated as ‘outstanding’ in BREEAM awards since its completion, the building at King’s Cross includes a range of air handling units, diffusers and other bespoke solutions created and supplied by TROX. Main contractor Kier Construction and their building services specialist KP&E worked closely with TROX UK to provide an air handling solution for the project, which would meet the most demanding of environmental requirements. In particular, they were keen to find a supplier which could come on board as a ‘one stop shop’, unconcerned by the complexity of the venture and its many requirements. Neil Addison, from TROX UK, said: “The comprehensive nature of the TROX product portfolio meant that almost all of the components for the air handling system could be supplied by us, so we were able to offer the contractor a more streamlined delivery process. The air handling units installed at Five Pancras Square are from the TROX X-CUBE range. A total of 17 units were supplied for a total airflow of approximately 150 m3/sec. Modelling of the system during the design stage demonstrated that the X-CUBE air handling units were capable of delivering the project specified Specific Fan Powers (SFP), enabling the project team to achieve an ‘outstanding’ BREEAM rating. The freely configurable TROX X-CUBE units define new standards in quality, flexibility, reliability, energy efficiency, and hygiene, with performance underpinned by independent Eurovent certification. The X-CUBE’s enclosure incorporates special construction and insulation features for low leakage and optimised heat recovery. Intelligent control and highly-efficient IE2 or permanent magnet IE4 compliant motors also contribute to outstanding energy performance. Hygiene of the unit is unparalleled, meeting the VDI 6022 guidelines and the DIN 1946/4 requirements as standard, with an AHU Guidelines 01 compliant option for even more demanding environments. TROX X-CUBE can be supplied with a choice of energy-efficient heat recovery systems, such as regenerative thermal wheel technology, plate heat exchangers or composite circulation systems to suit the application. In addition to the air handling units TROX supplied an extremely wide range of VAV units, diffusers, jet nozzles and grilles for the project. A combination of TROX Type AH linear bar grilles, AT adjustable blade grilles, AF floor grilles, and AE eggcrate grilles were also supplied. In addition, VAV units from TROX’s range, including Type TVJD air terminal units and Type TVRD circular VAV controllers provide the essential capability for energy efficient variable air flow. James Carpenter, Kier Project Manager commented: “Early engagement with TROX through the procurement stage brought great benefit to the project as a whole. “Being able to offer our client a whole TROX system solution raised confidence in our approach for the delivery of this state-of-the-art building. Five Pancras Square is now the innovative new headquarters of Camden Council. In addition to Council office accommodation it provides, across a total of 11 floors, a leisure centre, two public swimming pools, library facilities, a café, and a customer service centre. Conceived from the outset as a sustainable building, it achieved a BREEAM ‘Outstanding’ rating at design stage with a score of 93.05%. Pics courtesy of JOHN STURROCK. Please credit accordingly.